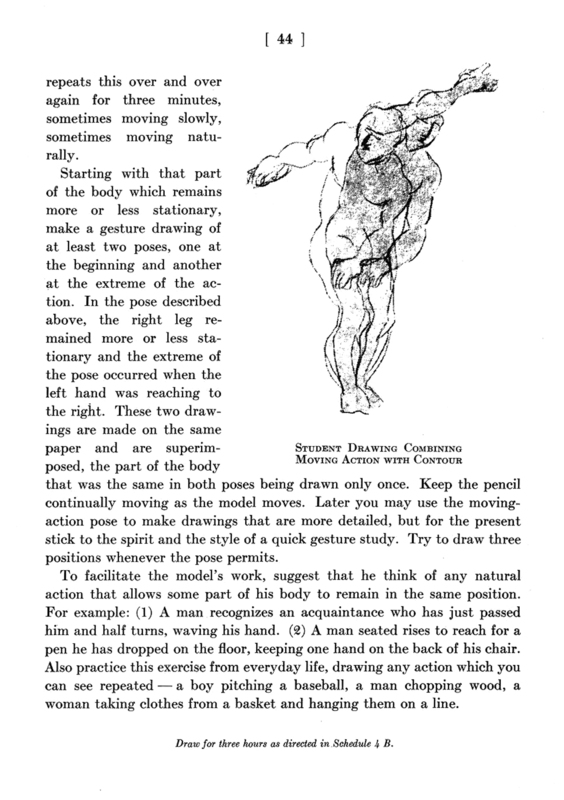 Posted here are two pages here from The Natural Way To Draw by Kimon Nicolaides. I recommend it, it’s a complete study guide including exercises & assignments! I own a copy today as does the school, I suggest taking a look at it. 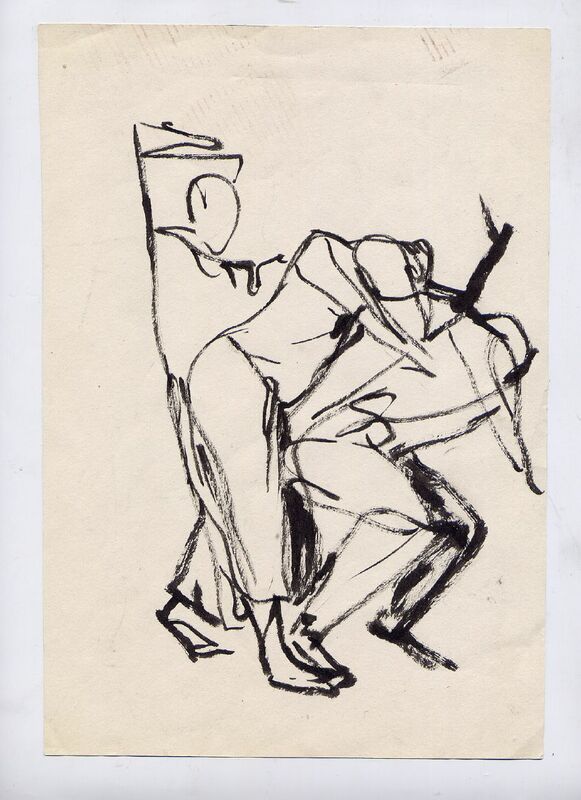 Nicolaides laid the ground work for a lot of ideas people use in art instruction today, and is on record as the first to put the idea of Gesture Drawing, down in an instructional text. 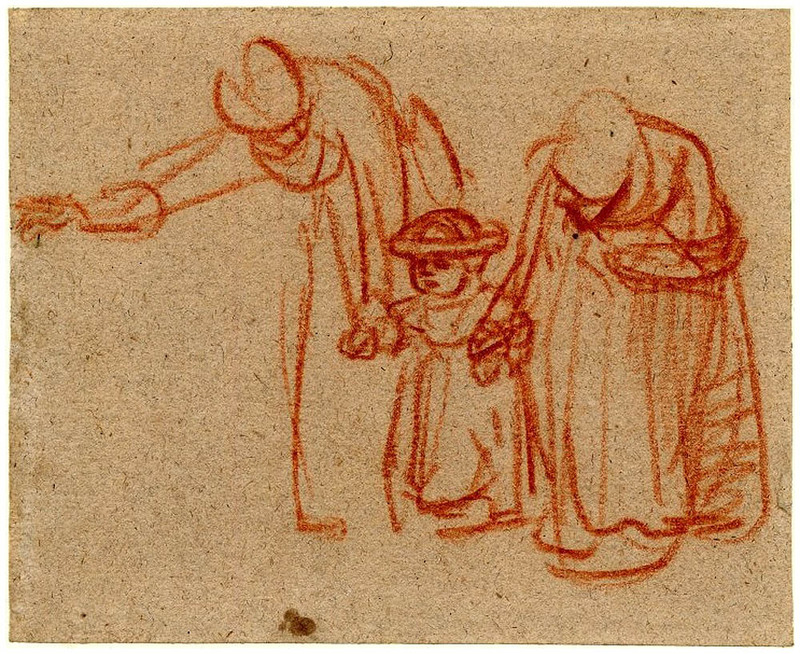 The technique predates him-note the example of a gestural drawing by Rembrandt on the wiki page I linked too? That’s from about 200 years before Nicolaides time. But no one else seems to have formally written about it in modern times before he did. When I was learning I was taught several techniques that I didn’t know then but later learned were based on his work. Ironically doing gestural moving studies was not one of them! But a lot of the ideas that wen’t into my exploring it did. My finally exploring them came from something I started doing on my own, hanging around dancers and live music events and sketching those. But it didn’t surprise me to find it something he included in his popular book when I discovered it myself as an adult. A great deal of our class is going to exploit the challenges of Gestural, moving subject studies. So I thought it fitting to share these and knowledge of the book. I’ve built a lot of the course around this tool to achieve a few goals. Not least is to force working without too much hesitation, abandoning literal accuracy in favor of more expressive and fluid lines. The model will not be holding still, so neither can we. I’ll be teaching you some techniques in the first class to help facilitate this. And part of the reason for the Tai Chi instruction in the 2nd class is to pick up some relaxation techniques, along with connecting the motions we will draw in that class, with movements we’ll have made ourselves. At first to make it not too daunting, sessions will start with a simple repetitive moving pose, as is described in the pages of Nicolaides’ book. Then we’ll have the models take on more nuanced and fluid motions. As the weeks progresses we’ll be exploring even more dynamic subjects, dancers in full swing, and feudal combat performers. Very little of our live model work will ever involve long duration still poses. There will be still life subject studies for that. The goal of most live model class work will be to exercise hand eye coordination, the physical rhythms of drawing, and learning to leave your hesitations behind. 02/01/2014 | Filed under Class Blogg, Class Resources and tagged with Anatomy, DynamicDrawingGestures, practice, quick pose.